Hello hello! I’ve been blogging on and off for a little while due to a few other really exciting projects in the pipeline, but I’m finally back to regular posting – yippee! So the strangest thing just happened to me, I received a text from Barclays telling me my card was being investigated for fraud. They had detected unusual activity and were getting ready to block my card. Barclays then sent me a text with a list of recent transactions and asked me to confirm if I had made those purchases. In a panic, I jumped out of bed and switched the light on to see my phone better. It turns out that I had in fact made all of those transactions. I was spending so much that it had been picked up by their fraud team…whoops..
You’re probably wondering what exactly have I been going crazy with? Well a bunch of stuff really, and of course I will be sharing it with you all but first I want to show you all the new beauty bits that I’ve picked up this week. I’m so sick of my usual eyeliner and foundation that I wear every. single. day. that I’ve decided to start investing in some new bits that will hopefully help to change up my look a little bit. Garnier Micellar water – Before I wash my face, I have to take off the bulk of my make up. Otherwise it just seems like I’m spreading it around my face and not fully cleansing. I’ve previously tried cleansing oils, creams, you name it really and I’ve given it a go at least once but most of them leave my skin feeling dry or oily. Nothing comes close to how great micellar water is. I use it pretty much every day so I had to restock with the bigger bottle this time. I’ve already written a post on how great this cleanser is (read it here). I regularly go through tubs of this because it’s one of the few cleansers that help gently exfoliate my face and body without leaving any residue. It smells pretty great too! I did go a little crazy with my concealers. My dark circles are getting worse over time and since I’m South Asian and prone to get them, the only real thing I can do about them is to find something that really covers them up. I’ve been watching A LOT of Youtube videos to help me find a way that really works for me in concealing those pesky circles. 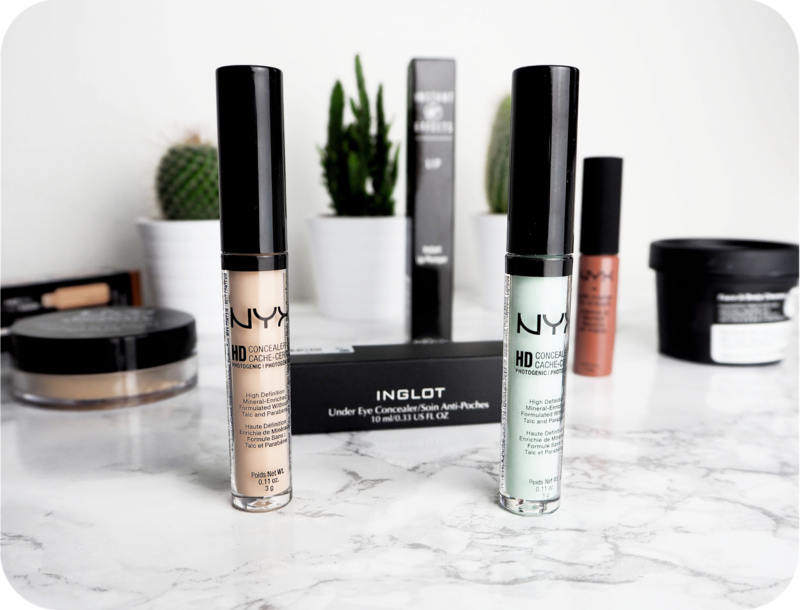 Ingot: Without a doubt, one of my favourite makeup stores is Inglot. The quality of their makeup and the customer service in their stores are second to none. The staff are so helpful and friendly and there is no pressure to buy their products either which always helps! I decided to go get colour matched today as I’ve tanned quite a bit and I also wanted to try out their concealer. I was told to by a shade 1-2 shades lighter than my foundation colour so we decided shade 91 worked best for me. Hallelujiah! 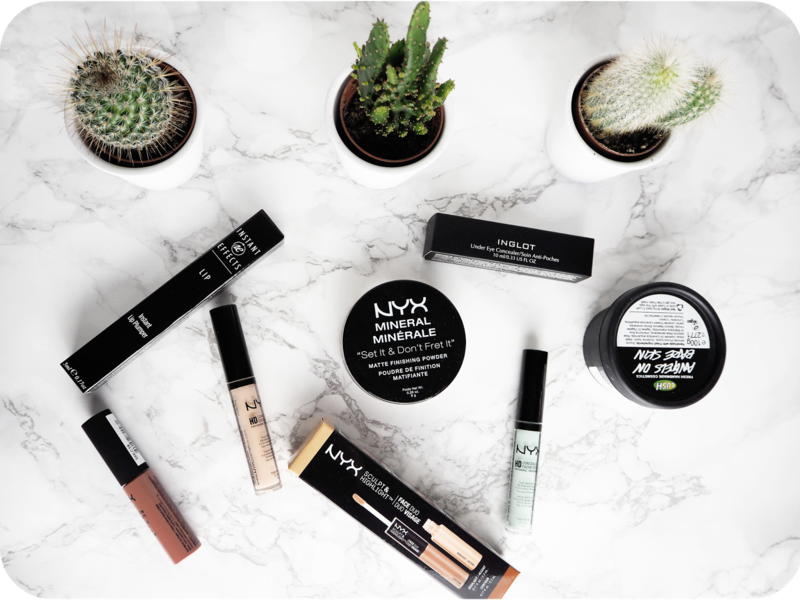 A huge NYX counter is now open in Stratford Westfield. I did go a tiny bit crazy and bought two HD Photogenic concealers. One in green and the other in shade ‘light’. I’ll be honest I haven’t heard too much about them but I’m loving the idea of using a green concealer under my eyes. because I have parts that are red base, and parts that have blue/purple tones. I really think this powder should have been called “Set it don’t sweat it”, don’t you think? I had recently seen so many people recommend this powder over on twitter that I had to try it out for myself. I’ve been using the MAC translucent powder for a little while now and although I haven’t had any problems with it, I haven’t been entirely wow-ed by the product either. I decided to buy this in the shade light instead of translucent, to see if it makes much of a difference. I’m really hoping this lives up to the hype! I’ll be the first to admit that I’m a contour novice. I haven’t a clue what I’m doing when it comes to contouring and because I’ve got such a small round face, I feel like it never quite looks right on me. Still I’m still determined to give it a good go and when I saw that the woman on the packaging was South Asian and had a round face I had to pick one up. Chiselled cheekbones, here I come. I tried and I tried to walk away but I just couldn’t resist. Even though most of the lip creams had been raided and the shelves were pretty sparse, I couldn’t help myself when I spotted ‘Cannes’ sitting all alone on a random shelf. I took it as a sign and had to snap it up. 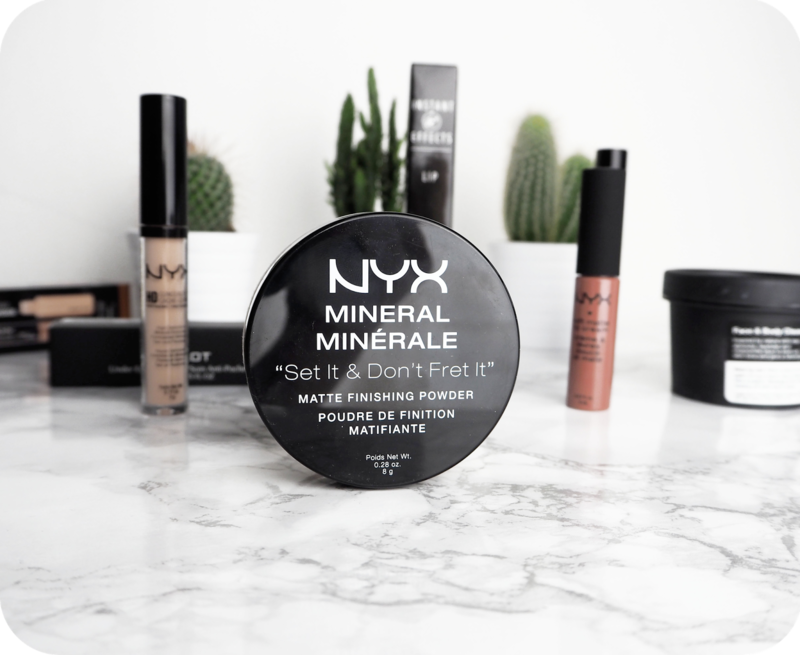 This is the only item that I’ve already tried out and let me tell you, it is dreamy! I love the consistency and how full it makes my lips look; such a pretty shade too. My sister told me about the lip plumper from instant effects a couple of weeks ago and ever since then I’ve been google searching and Instagram searching images of before and after pics. Some of the pics show no difference but some look so amazing that I had to try it out for myself. Since I’m so scared of getting fillers and I really really want bigger lips, I’m hoping this will be a pain free alternative that will give me exactly what I want without the pain or hassle. And that’s the end of my beauty haul. I have yet to try out pretty much all of the products but I’ll definitely them all separately and let you know what I think.